At Inhealthcare, we have a unique approach to digital health. We specialise in providing the infrastructure and software tools to enable digital health to be done better. Central to all of our services is technology that allows us to easily create new pathways, or make improvements to existing ones in just a few simple steps. Imagine as a healthcare professional, that your ideas around service improvement could be easily embraced by simply dragging and dropping alterations to a pathway. Imagine that suggestions on how to increase the efficiency and effectiveness of services could be implemented quickly, rather than being told that it’s just the way it has always been done, and it would be too complicated and expensive to change anyway. Many clinical gains in efficiency originate from automating manual processes, and inviting patients to self-manage their conditions. Our technology enables a clinician to make changes, or even develop a whole new digital health pathway, quickly and simply. Take for instance the typical pathway for warfarin patients. Here patients make the regular trip to the clinic, on average every 3 weeks, to provide a finger prick blood sample to measure their INR (rate at which the blood clots). Specialist warfarin nurses then use decision support software to help to plan the patient’s warfarin dose instructions for the next few weeks and, sometime later, the patient then receives these instructions, often through the post. That all seems pretty reasonable. But now consider the 1.2 million people in the UK on warfarin, which equates to over 16 million visits to the clinic each year. The financial burden of this is enormous, not only to the NHS, but also to the patients who have to take time from work and pay for travel and parking expenses to make the regular trip. Not to mention the inconvenience and carbon footprint. So how can technology not only make this pathway more efficient and effective, but most importantly enable better clinical outcomes for patients? -Task based activities for example, could send a patient a questionnaire online or maybe ask for a vital sign reading via SMS. – Clinical alert activities, which could perhaps notify a patient’s care team in response to a patient’s weight showing a downward trend. -Technical activities, which could for instance a request could be made to check a patient’s identity. We integrate with GP systems and the NHS Spine among others. We also provide an open API, which in non-technological terms means standalone health apps can easily integrate and connect with our digital health platform. Let’s think back to the warfarin clinics. Our digital pathway engine enables the INR service to be redesigned, allowing patients to self-test their own blood. Readings can be sent to the decision support software using a method of communication to suit the individual (e.g. online portal, automated phone call, SMS). Dose instructions are then sent back to the patient, and clinical systems (such as the GP patient record) are updated accordingly. Analytics is built into the Inhealthcare Digital Pathway Engine, providing dashboards of real-time and historic information. This provides fantastic metrics on all aspects of a service delivery, enabling monitoring and continual improvements. So what about the outcomes for the redesigned INR self-testing service? Not only is patient satisfaction very high at 100%, but the risk of stroke and other adverse events has reduced sharply. A key safety measurement in warfarin management is, how much time per day a patient’s rate of blood clotting stays within a ‘therapeutic range’ – the more time they spend in range, the less chance of a stroke. In a cohort of the redesigned service, patients improved their time in therapeutic range (TTR) from an average of 59% to 76%. 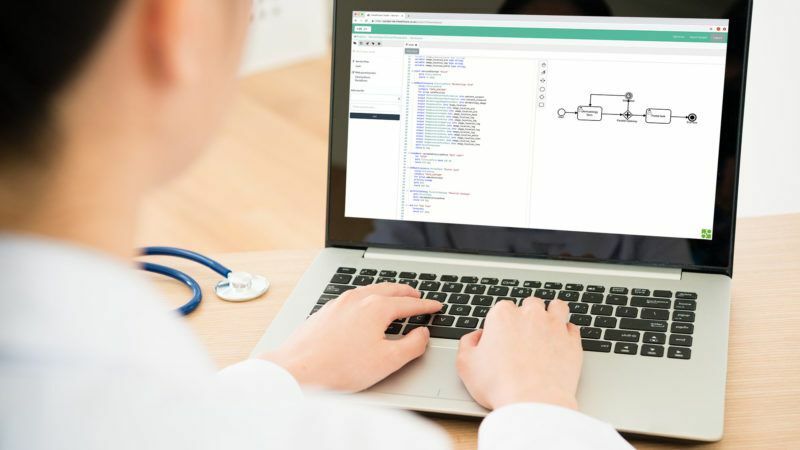 Clinicians tell us our Digital Pathway Engine works because it gives them the freedom and choice to design pathways that work for them and their individual patients. If SMS suits one patient as a method of communication, logging onto an online portal to submit the latest reading might suit the next. One patient might need to be contacted once a week, the other every four. Using a simple drag and drop process, simple, flexible pathways can be designed.